“This is our biggest show so far. We basically can’t believe you’ve all come here to hear us play”, admits Elena Tonra, vocalist of three-piece Daughter, to the quietly seated audience in the plush Hackney Empire. Timid, bashful and blessed with a slightly awkward stage presence, Elena and her continental counterparts Remi Aguilella (drums, Switzerland) and Igor Haefeli (guitar, France) gaze shoe-wards as they serenade the sold-out audience with songs so brutal in honesty that they betray the band’s guarded persona. The agenda is set early on. Tales of broken relationships, unrequited love and self-deprecation are accompanied by detached instrumentation only just held together by Tonra’s gossamer vocals. “If you leave/when I go/you’ll find me in the shallows,” sighs Tonra in her distress. Her vocals sing in towards herself in a kind of reverse-projection that compels the audience to listen intently. Resignation is the only option offered for dealing with toxic relationships: “Come out/come out/to the sea my love/and just drown with me.” It’s not surprising that this leaves a bitter taste, as a refrain in Landfill tells: “I want you so much/but I hate your guts.” These are songs that do not cry for help, but wallow sadly in the dissatisfaction of life. 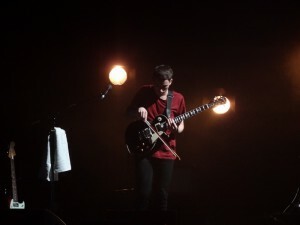 Dark, sparse guitars, sometimes played with a double bass bow, are adorned by the cold contrast of white spotlights and dark spaces on stage. The tell-tale guitar picking that introduces Youth draws the biggest cheer of the evening. One can only assume this is due to the song’s fame (garnered from being used to soundtrack London Olympics coverage), rather than the heart-breaking subject matter: “Shadows settle on the place that you left/our minds are troubled by the emptiness” is reminiscent of grieving for a loved one, while “I’ve lost it all I’m just a silhouette/a lifeless face you’ll soon forget” brings the topic back around to loss in the romantic sense. Capturing our generation’s attitude towards flesh as a cheap and easily transferrable commodity, Candles sings of the sadness of sexual disunity: “We both know I’ll never be your lover/I only bring the heat/company under cover/filling space in your sheets.” Jealousy enters the picture in, the either knowingly or ironically entitled, Love: “Nights of loveless love/I hope it made you feel good/knowing how much I adored you.” If these lyrics are autobiographical, it’s small wonder that Tonra’s stage presence is reluctant and unassuming, albeit in a thoroughly endearing way. Set-closer Home is self-aware, as she suggests “I think I should be a little more confident/in myself/in my skin.” Judging by the admiration in the room tonight, that might not be an impossible dream.